Adults can now sign up to drive for an event without having to sign up to attend the event. This feature is available on all pages where you can sign up adults for an event. Regardless of whether they plan to attend the event, drivers can now indicate whether they can take scouts to the event, from the event, or both. Drivers may now indicate the number of seats that are in the vehicle they plan to drive to this event. This number will default to the number of seats entered for this adult's primary vehicle on his membership record. 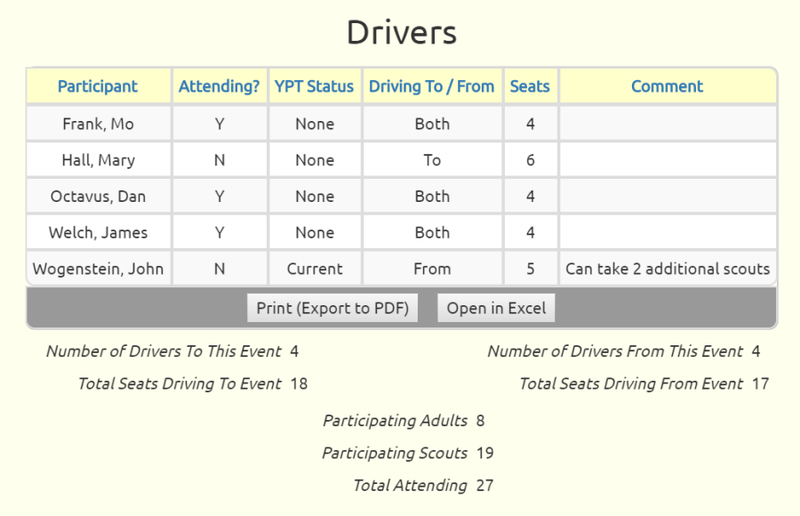 When you select an event from the calendar that has drivers, the detail page will display a special section listing the drivers, followed by the total drivers and seats going to and from the event. If there are drivers for an event, both the Participant List report and Tour Permit Worksheet will include a section that lists the drivers. 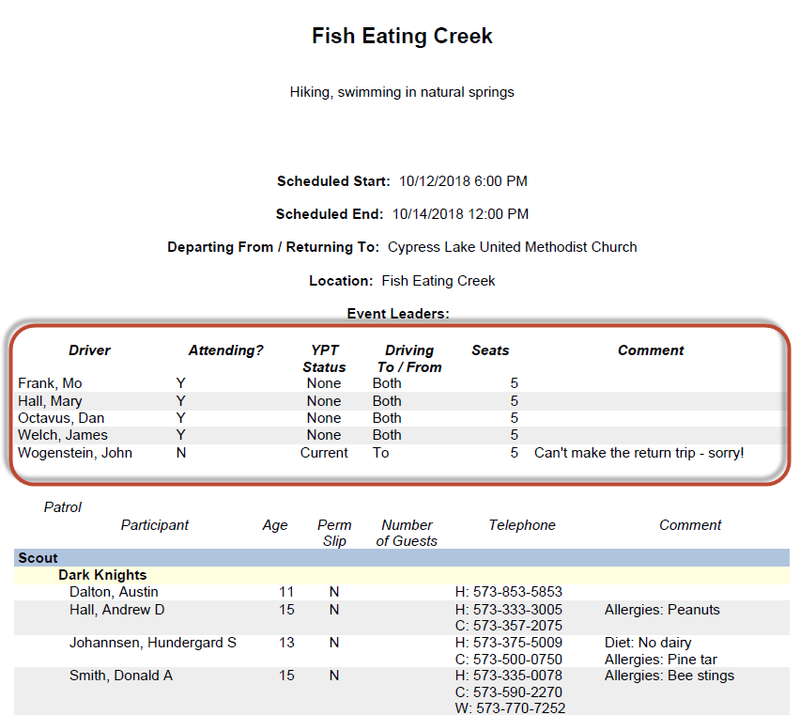 You may now configure an event type to track the number of guests for each participant. 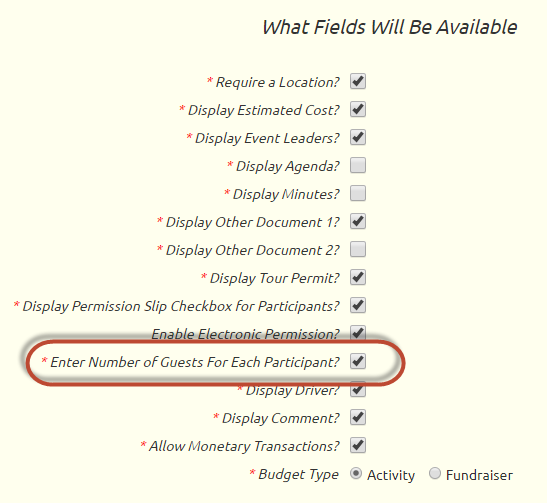 Once you sign up for an event with this option, you will be allowed to enter the number of guests you plan to bring. The names of the guests may be entered in the Comment field. The total number of guests will be displayed on the calendar detail page, and will be included in the Total Attending value. The Training Expiration Dates section of the newsletter will now include training that the recipient has never taken, but that is required for a dynamic subgroup to which the recipient belongs. In the Boy Scout version of TroopWebHost, it also consolidates training for all courses that share the same BSA course ID. This was necessary to handle the new "Youth Protection Training 2" course, which has the same course ID as the old YPT course. Adults who have only completed the old version of YPT will now show an expiration date no later than 10/1/2018, since it is no longer valid after that date. But if they've taken the new course this year, the newsletter won't show any YPT as being expired.